UV- BRITE: with the growing popularity of tanning beds and extended exposure to sun light, all nail products can at some point discolor or yellow. This unique product contains a UV blocker and an optical brightener. The UV-Brite makes the French White appear even whiter and optimizes the effect of nail polish colors. 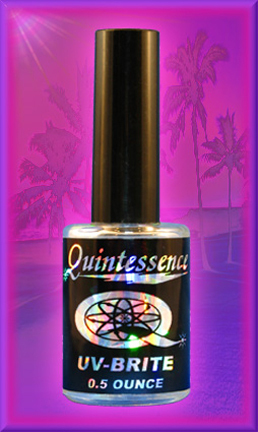 UV-Brite will prevent yellowing of the Quintessence Products. This product air-dries in about 1 � to 3 minutes, apply just like a polish. Apply one thin coat after you have completed your nail application. It can also be used to restore the shine.